As the departure date for my trip to Milan and Salone del Mobile quickly approaches, I’ve found myself thinking about memorable brands that STAND OUT to me. Below is a story about how I met the Creative Director and Founder of RUX Design, Russell Greenberg. Since this year is the lighting year at Salone, I thought it would be fitting to share. I hate walking most trade shows. After 18 years of attending one after the other, they have all started to look the same. Aisle after aisle, and row after row of products stacked, assorted and styled, hoping to catch the eye of the shoppers walking by. They have started to remind me of 13 year old boys attending their first middle school dance, standing against the walls of the gym too afraid to approach the girls they have a crush on. 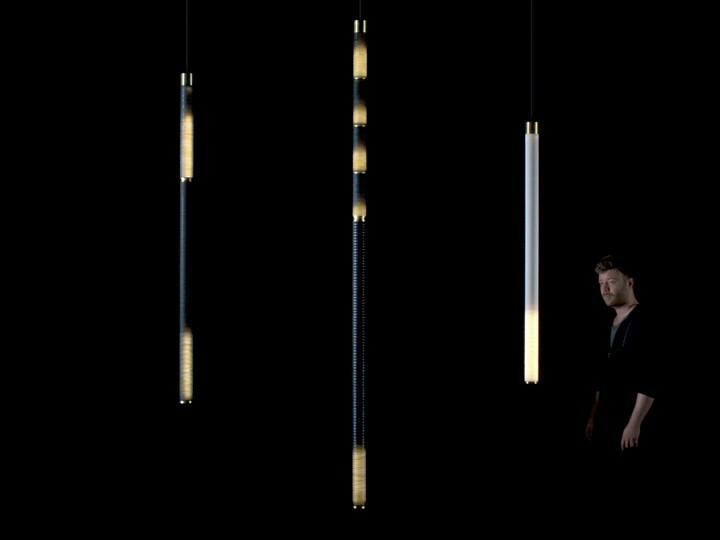 It is very rare to see one be bold, to see an installation that grabs you by the face with both hands and says “look at me.” But at Collective Design in 2018, this is what the StickBulb brand did to me. The booth was not overdone, nor was it superficial in it’s grasp for my attention. Its walls were painted white as most are, but the exhibit, which was called Fire and Ice, featured a backlit image of what looked to be a European castle in ruins covered in ice. It felt like something I dreamt about once as a child, or imagined as I read about lions, witches and warlocks. In front of the image hung a lighting fixture over a thick rough hewn wood beam that looked as if it had been excavated from inside the crumbling castle. The beam sat atop a goat skin rug which at first glance resembled snow, and gave me a chill causing me to grab both of my arms as if hugging myself in search of warmth. I am not sure how long I stood there taking it all in, the cycle of life, the rejuvenation of a building reincarnated into its next life, shining a light onto the generations to come. This is the design practice behind StickBulb. They work with sustainable materials building fixtures from fallen trees, old water towers, and buildings that have lost the ability to provide shelter. Designing in this way takes a special kind of person, it takes effort to work in this way, it requires a consciousness that believes that less waste is more beautiful, so it was no surprise that the other light fixture that stopped me in my tracks just a few spaces down, was created by the same person. In contrast to the light, airy, horizontal configuration of the StickBulb designs, the Gradual pieces felt heavier, but not in an ounces and pounds kind of way. They have a depth to them which to me translated as grounded. They hung vertically in the black painted booth, and were black themselves in color, made of a black folded material that resembled the trappings that live inside of an accordion. The cylindrical forms were accented with rings of brass, which for some reason made me think of a sacred forest of old sequoias outside of Big Sur, but also of Cleopatra and something else that I could not quite put my finger on. The light source that lived inside the black cylinder was dim, and it moved as if it were a leaky faucet dripping beads of water into a glass. “Ok, what am I looking at here,” I asked knowing that I was experiencing something special, something more than just your typical light fixture. The gentleman manning the booth had kind eyes, a neatly trimmed beard, and had a look of fatherly pride on his face as he recognized the interest and excitement in my voice. Looking back over his life, it is clear why Russell’s interests have moved to the subject of time. With his father’s early passing, Russell began to question What is a life and how long can it be? His study of music, which began at age 6, also affected his thoughts on time. I sat and listened and watched as Russell paused to take a long sip from his glass of dirty lemonade, a mixture of lemonade and espresso, a pairing which to me sounded revolting but from the look on Russell’s face, must have tasted like pure pleasure. He sat back and looked at the cup after swallowing, lost in the experience of flavor, and in that moment for both Russell and I, time slowed. As Russell spoke I started to visualize what one of his experiences might look like. I had been so strongly impacted by his small cylindrical light, so I could only image what an experience as large as his showroom might be like. If a light fixture can change the way we think about time, what kind of impact could that have on the life of an individual, the life of a family, and life on our planet. Would we in fact begin to appreciate our families more, our planet more, and cause us to live our lives in a way that grabs us by the face with both hands and says look at me?